“Today, as design becomes increasingly concerned with competitiveness and quality of life, innovation must again facilitate a creative response to change. John Clappison’s team at Hornsea in the 60s churned out winning designs year on year, developing and colliding craft techniques, to a classic standard with a trend awareness and clear passion for the market”. Although not as familiar as many of his ‘name’ contemporaries, to us John Clappison was the most prolific and innovative designer at the forefront of British pottery, and his work was highly reminiscent of the most advanced in studio ceramics. Throughout his career Clappison wanted to improve the quality of design for the mass market, and at Hornsea Pottery he created some of the most popular ranges available in the UK from the 1950s through to the 80s. 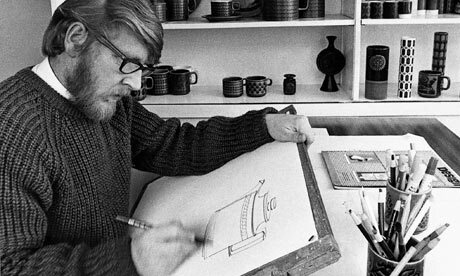 Working in the Yorkshire coastal town of Hornsea, whilst the mainstream pottery industry was firmly centred on Stoke-on-Trent, helped him to develop a unique response to contemporary design. The essence of Clappison’s work was a simplicity of character that gave a certain charm and coherent language. 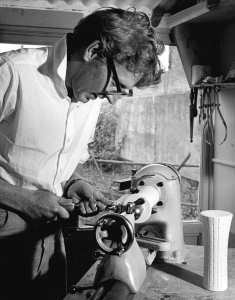 This happened not mere accident, but rather of a particular way of thinking informed by his knowledge and understanding of the possibilities, but more importantly the limitations of the Hornsea company and its workforce. Handpainted decoration in the style of the popular Midwinter Pottery was not possible at Hornsea, as it was very expensive, and using transfer-printed sheets was also ruled out as too costly for such a small factory. This gave the young John the opportunity to develop his ideas in ceramics, coalesing into experimental decorative designs that incorporated a new printing technique. It was this decorative technique that screen-printed a resist medium on to the biscuit wares before glazing, in order that the glaze covered the unprinted parts of the design creating contrasting semi-matt areas. 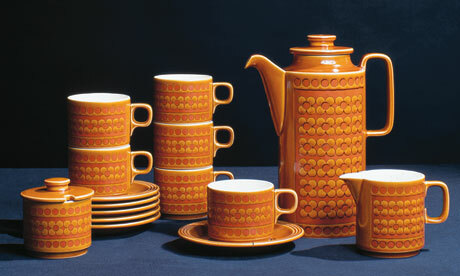 This technique was successfully exploited by Hornsea and it was the use of this process, combined with an accidentally-produced pattern which came out of the kiln as matt and gloss, which became Hornsea Pottery’s mainstay, as the hugely successful Heirloom range launched in 1967, and Saffron from 1970. The lesson we can learn from the experience of John Clappison is that limitations can give rise to creativity, whether they happen to be in timespan, space, materials or processes. Such technical restrictions allow work to take place in a particular way to provide a range of cohesive characteristics and a language similar to a fixed set of rules that gives simplicity of form to objects. These imposed constraints, if taken as an opportunity can provide a discipline to shape our creative thinking and activity in ways that would not initially appear desirable, and yet through this process we can improvise and take pleasure in the outcomes. *When first posted the quotation was originally attributed to Wayne Hemingway, this was corrected on 23rd November 2016 to the author Marcus Holmes. Thanks to Marcus for drawing our attention to this. ← Happy Birthday Habitat; the story of a little brown teapot.